Bright, open-concept loft space with 10 foot high ceilings and a spectacular 8 foot high entrance door. 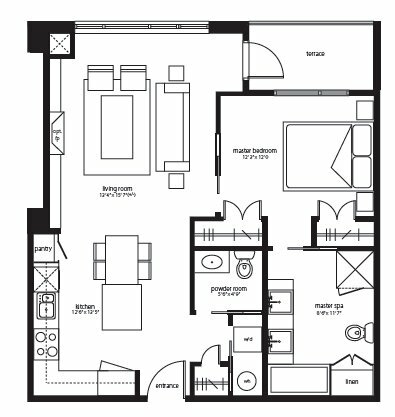 Loft sizes range from 600 to 1200 square feet and are offered in a variety of floor plans including one bedroom, one bedroom with den, two bedroom and two bedroom with two full bathrooms and den. The inside of the units also feature 8 foot high pocket doors. Visit www.bauerlofts.com for more information. Located in the historic seagram's museum in Waterloo, these loft units are converted warehouse space once used by Seagram's distillers. The high ceilings and excellent views of uptown Waterloo are a selling feature. The lofts opened in 1999 and were completed in 2001. The 103 units sell anywhere from $150,000 to $400,000, though recent selling prices have been over $250,000. Looking for information on Kitchener condos like the Eaton lofts or the Kaufman lofts?